Who’s got big balls? Tanuki have big balls! 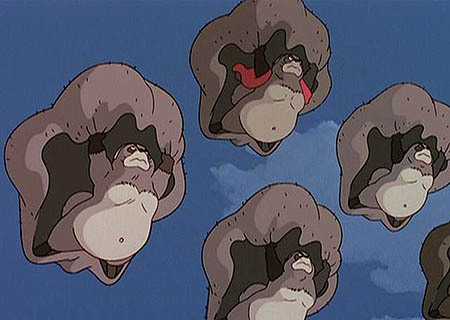 Anyone who has seen Studio Ghibli’s Pom Poko (Heisei Tanuki Gassen Pom Poko) knows that tanukis’ nut sacks are capable of amazing magical feats—from being stretched out into giant tarpaulins to transforming into magical treasure ships. And the Japanese people aren’t shy about their love for tanukis’ giant balls; images of well-endowed tanuki can be seen all over Japan, from ubiquitous statues in from of shops and restaurants to bank commercials to anime to … pretty much anything. What Does Tanuki no Kintama Mean? Tanuki (狸) gets mistranslated into English as all sorts of things, mostly badger or raccoon or the neologism “raccoon dog.” None of these really fit. Badgers (穴熊; anaguma) and raccoons (洗熊; araiguma) have their own Japanese names. “Raccoon dog” doesn’t really mean anything, so I personally just like sticking with the Japanese name—tanuki works better than anything else. And while kintama might just be slang, in the tanuki’s case these “golden balls” have a historical precedence. 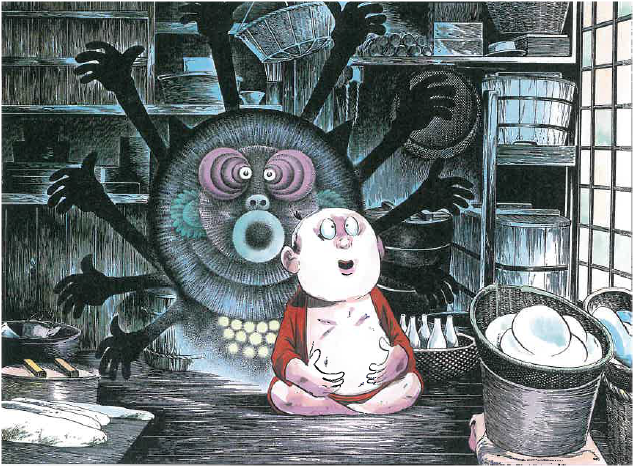 As yokai, tanuki are known to have several magical powers and interesting traits. 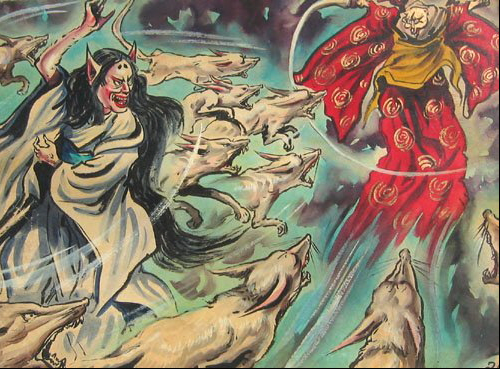 They are henge, shape-shifters, with abilities on par with and sometimes even exceeding those of kitsune (foxes), the most powerful of Japan’s magical animals. 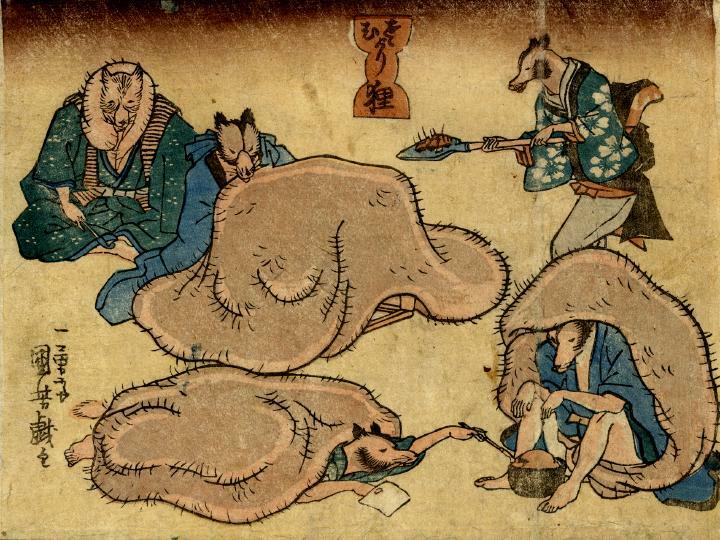 Tanuki are also famous for their belly drums (See the Belly Beating of the Tanuki) and their love of sake, food, and generally being the lazy, loafing tricksters of Japanese folklore. And their giant balls. But they weren’t always like this. The familiar tanuki that we know today—with the prodigious belly, straw rain hat, sake bottle, and pendulous testacles—is a relatively modern invention. It actually comes from the 20th century. 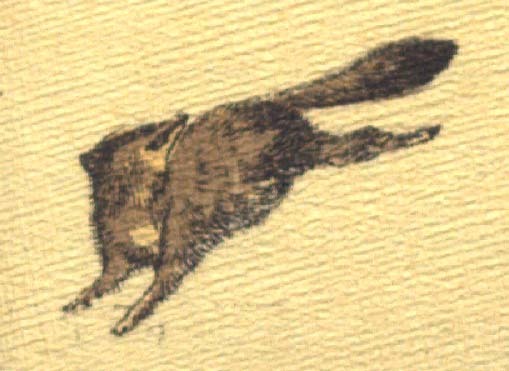 Early depictions of tanuki show a realistic animal. Japanese tests are almost completely mum on tanuki for most of history. 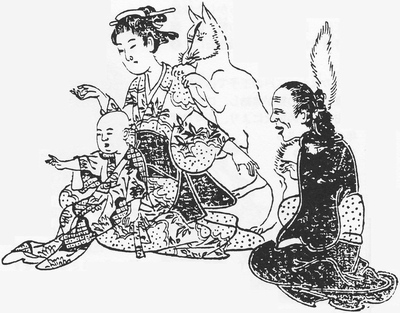 There is mention of the mujina (狢), a mythical animal associated with the tanuki in some areas, from around the 8th century. 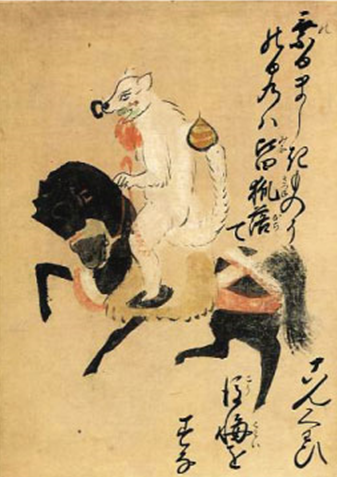 Toriyama Sekien (鳥山石燕) included tanuki in his 1776 Gazu Hyakkiyakō (画図百鬼夜行; Illustrated Night Parade of 100 Demons), but again this tanuki looks like a regular animal. The depiction of tanukis evolved slowly, with new stories adding new elements and transforming them slowing from the realistic animals to the cartoonish figured seen all over Japan today. 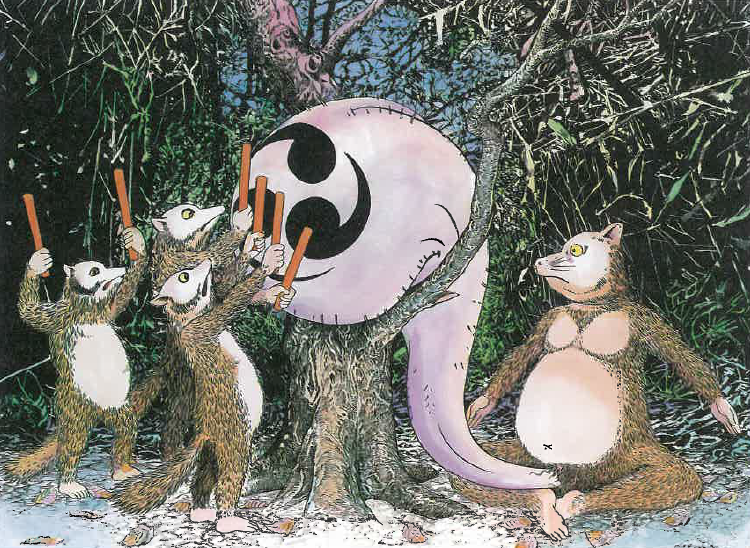 The big round stomach and accompanying belly-drumming didn’t become attacked to tanuki lore until the 18th century. 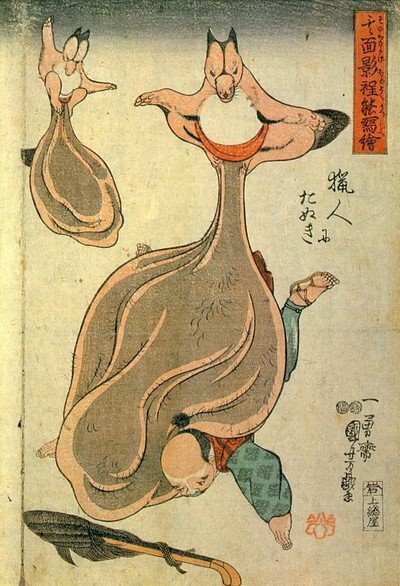 Several stories of tanukis’ belly-drumming appear around this time, although their famous nut sacks are still regular size. They didn’t develop elephantitis until later. The reason for the appearance is gold. 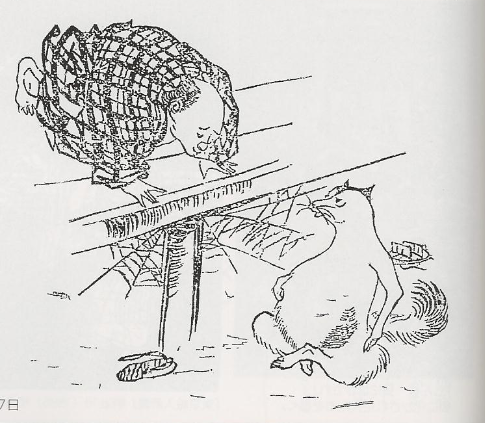 Owaka Shigeo traced the origins of tanukis’ magical scrotums in his book about Japanese metal working, Hagane no Chishiki (鋼の知識; Knowledge about Steel). He claims the myths began from goldsmiths and metalworkers in Kanazawa prefecture. In order to turn malleable gold into delicate gold leaf, they would wrap the gold in animal skin and pound it into thin sheets. They discovered that a certain part of a certain animal was the best for the business. Because of this, tanuki scrotums became known for their ability to “stretch” money and make it go further. Savvy marketers started telling tales of the magical properties of tanuki scrotums, selling them as good luck charms and wallets telling buyers that the scrotums would “expand their wealth” in the same way they stretched nuggets of gold into massive sheets. This association between wealth and tanuki testicles continues to this day. In modern times, Tanuki are said to embody “Eight Virtues,” with their large scrotums signifying luck with money. 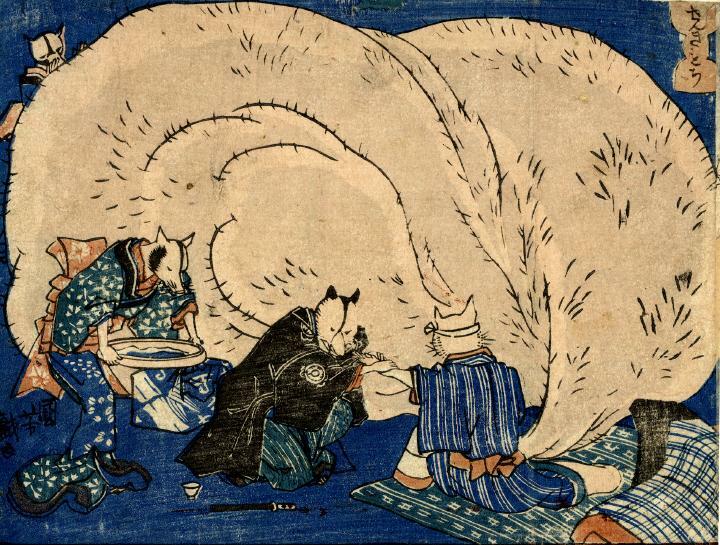 Once the myth of tanuki and their magical, giant balls hit the cities, the imagination of Edo period artists went wild. It really was too good of an idea, and made much too interesting of a motif, so artists expanded on the “stretching scrotum” idea. 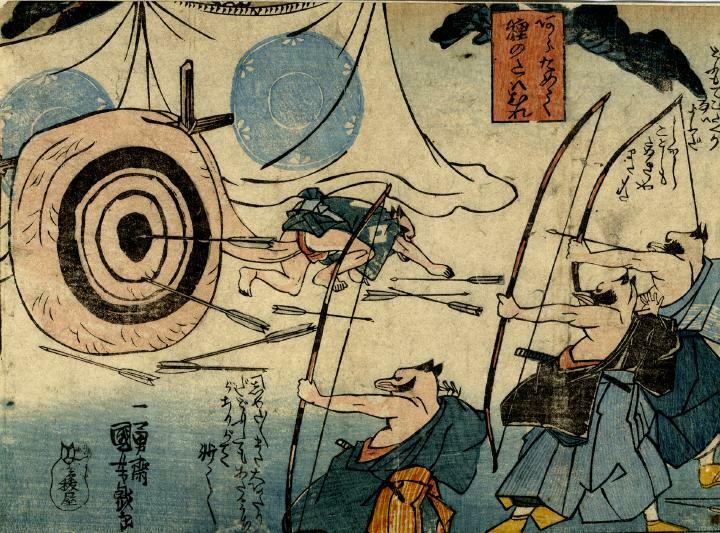 Suddenly, tanuki were using their nut sacks as weapons, sail boats, swimming pools, fishing nets, umbrellas … there was no limit. 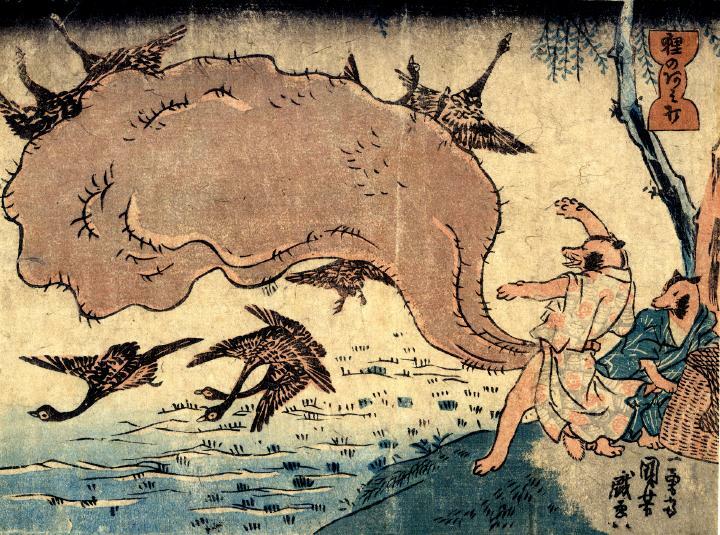 All of the great artists of the ukiyo-e period got in on the fun, out doing each other with even more outrageous pictures of tanukis’ magical scrotums. 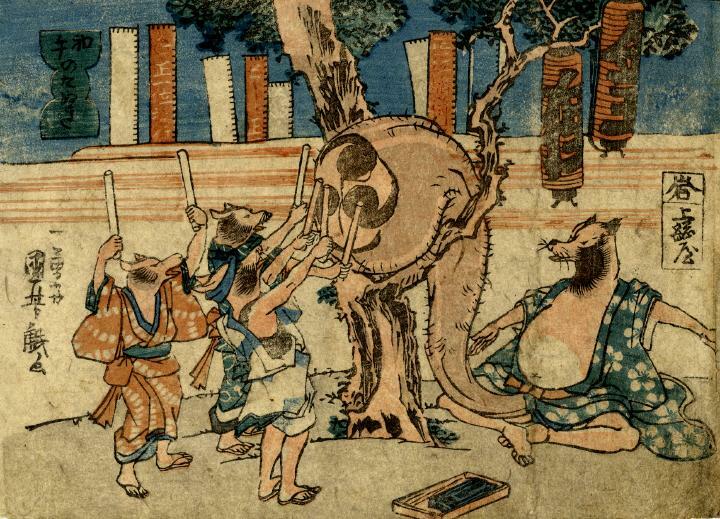 Utagawa Kuniyoshi did a particularly cool set of tanuki testicle prints that you can see here. 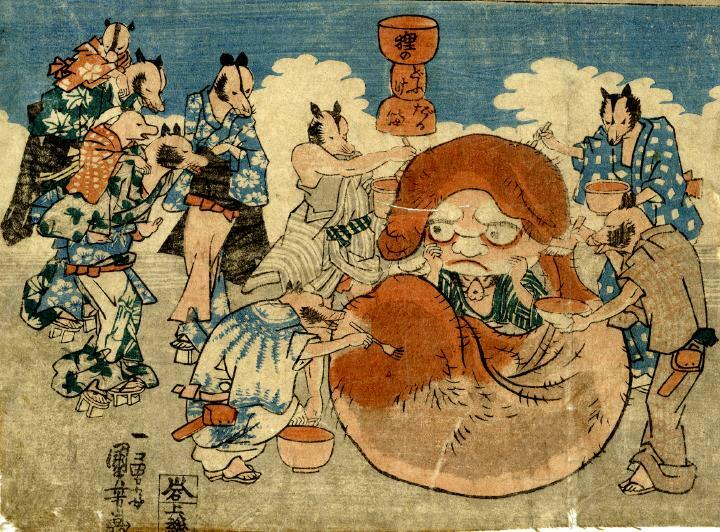 It was thanks to ukiyo-e artists that the idea of tanuki and their magical, giant balls became a permanent part of Japan’s folklore and popular culture. 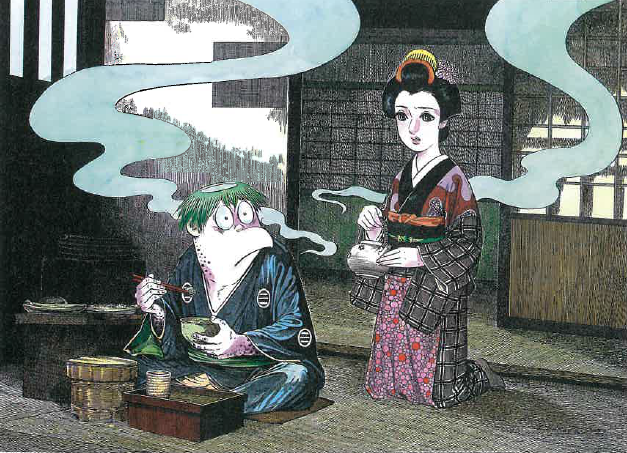 In fact, I think it shows that the addition was more of an artistic one than a storytelling one—there are many Edo period stories about tanuki, but most of them focus on either shape-shifting or belly-drumming. 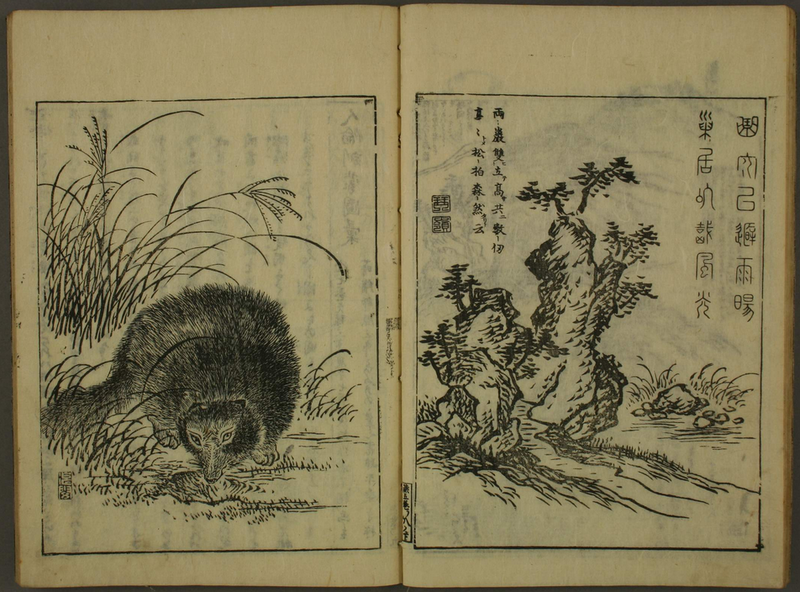 I have read few tanuki tales where their scrotums play a significant element to the story. The rest of the tanukis’ outfit—the straw hat, sake jug, and pay slip—didn’t show up until even more recently. The iconic image of the tanuki that we know and love today is really a product of the Taisho era (1912-1926), when more and more shops started using tanuki for advertising or as statues out in front of their shops. This article was largely sourced through the amazing website OnMark Productions. Anyone who wants to know everything about tanuki (and other aspects of folkloric and Buddhist Japan) should make that site their destination. I got most of my information from there, and only used additional sources to confirm and add a bit of flavor to the article. 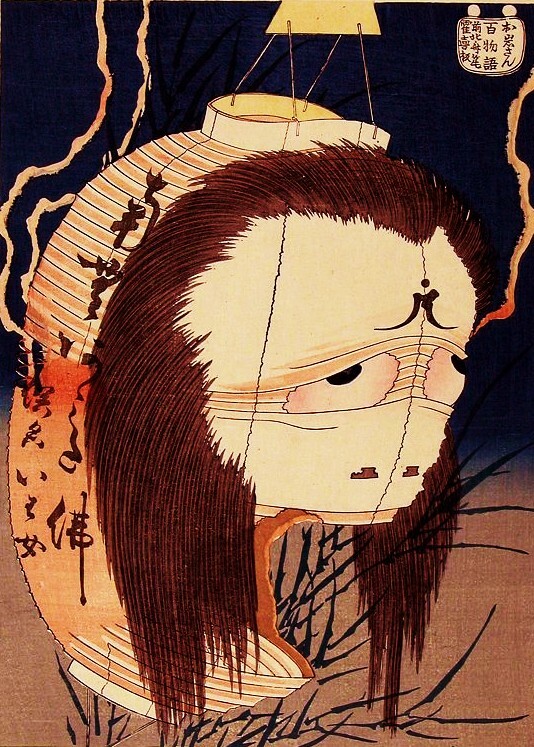 In Bushu, Tanma-gun, in the village of Bunkokuji, the village headman Heigo was once visited by a tanuki who had disguised itself as a Buddhist monk. The tankuki claimed to be a monk from the Murasaki Otoku temple in Kyoto, and was under a vow of silence so could only communicate by written notes. Bunkokuji was just a small, countryside village and the headman was honored to have such a holy guest, one who was so diligent in walking the eight-fold path of the Buddha. He invited the monk to stay with him and be fed as a guest. By the morning, the monk had disappeared, and outside his house Heigo found the body of a tanuki who had been torn apart by local dogs. His suspicious were confirmed. There was a tanuki who sat under the edge of a porch and drummed on his belly. Such an interesting sight was bound to become the topic of the neighborhood. The house in question was in Honishi, and belonged to a hairdresser. 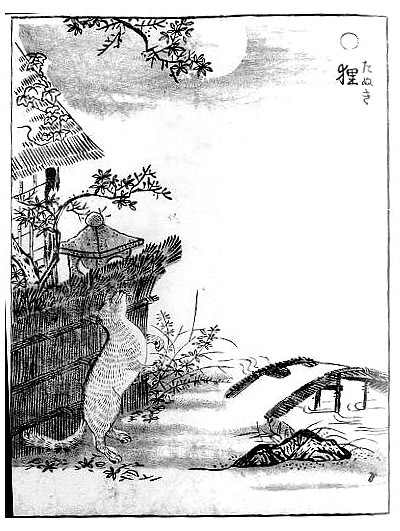 It all began one day in February, in the Eighth year of Meiji (1875) when a tanuki came running up to the house towards the backdoor, probably being pursued by a dog or something. The kind hairdresser allowed the tanuki to escape to a safety under his porch. That night, sitting on the back porch, the son of the hairdresser was mindlessly tapping out a rhythm on the hibachi stove, when from under the porch came an answering beat. The tanuki was drumming along with the boy on his own belly. This was just too much to believe, and the hairdresser summoned his neighbors to see if they too could hear the belly-beating tanuki. The tanuki went right along pounding out his tune; it didn’t stop even as night fell and darkness surrounded the village. The hairdresser could not sleep that night due to the incessant drumming of the tanuki, and finally shouted “Enough!” He went outside to the tanuki and in a pleading voice said “Honorable tanuki, we are all trying to sleep, so could you please be quiet?” With this said the tanuki immediately stopped his belly-beating. 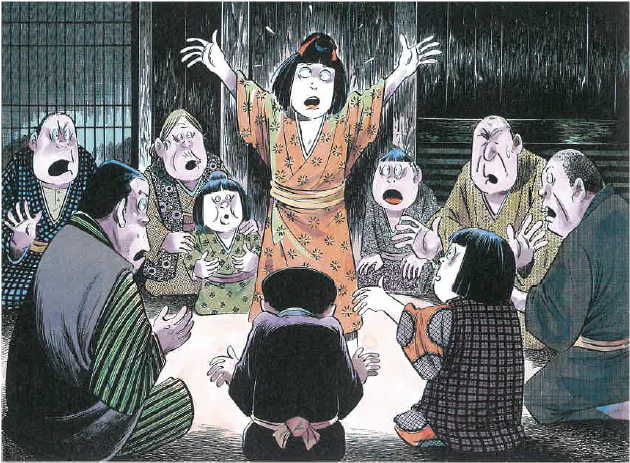 The following day, a great crowd gathered at noon to listen again to the belly-beating of the tanuki, and were shocked and saddened to find that no more drumming came from under the porch ever again. In another case, in the 15th year of Meiji, on July 28th, the Choya Shinbun newspaper published an article about a similar musical tanuki. Out near a rice field in a remote village, a samisen master was giving a lesson to his student when they both heard the unmistakable sound of someone accompanying them on what sounded like a hand-drum. Soon the master, student, and mysterious accompanist were playing along late into the night in a fantastic improvised session. With the coming of dawn, the drumming stopped as mysteriously as it had started. That morning, the body of an ancient tanuki was found in the rice field by the man who attended the water wheel. The tanuki’s body had blood streaming from its mouth, and its belly was said to have been beaten bare as if it had been shaved. This took place in Kyoto, in the town of Aiiwa. 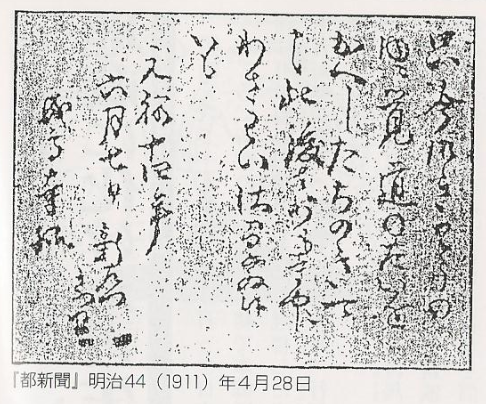 In one final story, in the 17th year of Meiji on the 28th day of May, the Yubin-Hoichi Shinbun newspaper reported that the wife of a photographer named Kyomizu from the Tokoku area kept a baby tanuki as a pet. The wife said that in the middle of the night she could hear the baby tanuki practicing beating out rhythms on its belly. The wife wanted to see what her pet was up to, and snuck in one night to spy on it. She said the baby tanuki was spread out flat on the tatami mats, with all four legs splayed wide and its nose pressed firmly on the ground. She could hear sounds of something like a flute and a hand drum coming from the tanuki. 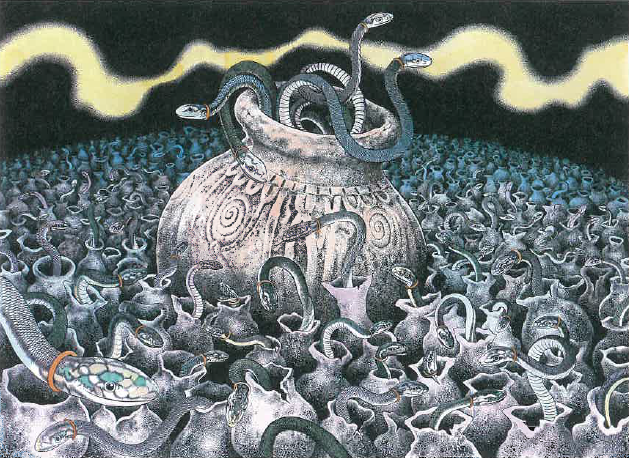 This story as been passed down by the people of Tokoku as a true story of magical tanuki. 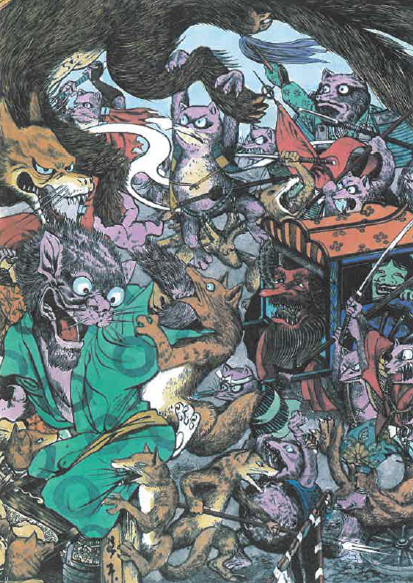 There are many more such stories about the belly-beating of tanuki. It is a legend that will not vanish any time soon.